The swine flu has hit CBU. Just from hearing my friends talk about people they know at CBU who have had it, I have counted 6 cases. I am sure there have been more. But nevertheless, the school is remaining hush hush about it. Instead of sending us high priority emails like they usually do about these "serious things" they have adopted a new method—documentation of sick people. It's strange. They interview all the sick people and fill out these ridiculous forms about what kind of sickness they have, what their symptoms are, where on campus they have stepped foot on since being sick, and who they have been in contact with. Talk about humiliating! In addition to that, all the CBU staff and faculty have been forced (or kindly coerced) to make sure no one sick comes to their classes or offices. It's pretty bizarre hearing students talk about how their teachers made them leave class. If feels like elementary school all over again. 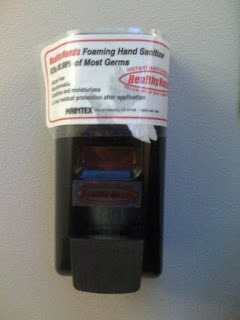 Pretty much all the offices on campus have huge things of lysol and CBU has put up these really nifty (yes, I used the 1980s word nifty in a blog) foaming hand sanitizer things ALL OVER campus. Mind you, I don't like using hand sanitizer very often ever since I heard about the study that said it causes autism in kids, but this hand sanitizer is very hard to resist. It FOAMS! And it smells YUMMYYYY! So, if I am risking the health of my future children, I better not get swine flu! I am part of the cool club now. I got an iphone monday night. There is nothing else to say—the excitement has left me speechless. The Daily Accomplishments of a Senior Slug. Today has been kinda a weird day. I finished classes for the week yesterday...so that left me in a semi-sluggish mood. Thankfully I had work this morning to get me up and moving, but still! After I got off work, I had lunch with Amber...then I came back to my apartment and did pretty much nothing. I DID make a very worthwhile $10 purchase though—Chris Tomlin's new Christmas cd. It's EPIC. So, I sat listening to Christmas music for a few hours. Then, Elizabeth and I made a trek to Target in search for boots. I didn't find the ones I fell in love with online, but I still managed to spend $20. When we came home, I ordered those boots online. There goes $30 more. So, my semi-sluggish-sit-on-the-couch-and-do-nothing-listen-to-Christmas-music-day left me $60 more broke. And that is how proper senioritis is lived out. Go and do likewise. Diagnosis: I am codependent. I am a caterpillar. I don't know how to break out of my cocoon. This is why I like people to make decisions for me and this is why I absolutely CANNOT make decisions completely on my own. Will I break out of my cocoon and fly one day? Yes. Someday. I swear it's unintentional. I don't PLAN on being late to all of my classes and late to work. What's my problem?! I'm usually the one who's early to everything. Question: Is senioritis a physical disorder or a psychological one?